Talking about rain was such an easy way to target speech and language goals in my early childhood and younger elementary aged speech and language groups. Below are a dozen ideas for using the rain theme in your therapy groups. 1. Rain by Robert Kalan is a nice predictable story. Print and laminate the story props from Kizclub and use a spray bottle to make it "Rain on the _____." Great for increasing the sentence length of those younger students! 2. It's raining out and grandma wants to take a nap. Find The Napping House story props at Kizclub.com, a story stick at Make Learning Fun, and the free The Napping House Describing Words at Teachers pay Teachers. 3. Answer Wh questions and teach the concepts wet, dry, and under. For a very fun, 10 minute, activity, I took a spray bottle of water and an umbrella into the early childhood classroom. Misting water over heads, it rained on me and on the teachers as a demonstration. Most students loved getting wet; however, before spraying, I asked each student if they wanted to get wet. Some would only want to have their hand or finger sprayed and others, not at all. Hold an umbrella over a student's head and make it rain. Ask the student questions such as Where are you?, Are you wet or dry? and / or Why didn't you get wet? 4. 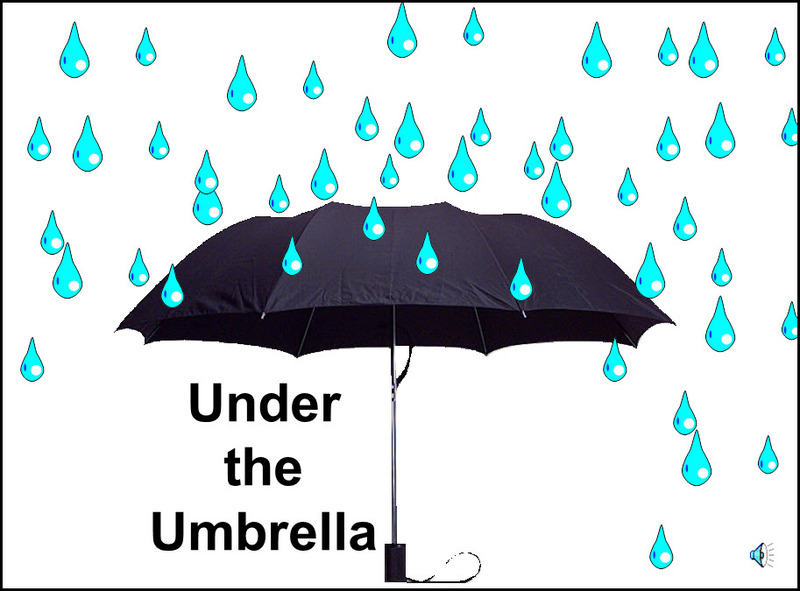 Download my free PowerPoint book, Under the Umbrella, to reinforce the use of not, wet, dry, and under in repetitive sentences. FYI - Definitely download this activity as it looks much better in PowerPoint than in Google docs. 5. Visit Speech Universe to download the interactive preposition book, Who is Under the Umbrella? 6. Talk about clothing that we wear when it rains. I had a raincoat that belonged to my daughter and a few pairs of boots. Students labeled the parts of the coat (snaps, pockets, sleeves, hood), matched the boots and talked about when they would wear these clothes. Click on these links to dress Caillou or Speckle for the appropriate weather. Match pictures of clothing to seasons at Montessori For Everyone.com - download Seasons and Clothing Matching. 7. For parents, suggest reading Raindrop Plop by Wendy Cheyette Lewison and look at these developmental activities for students one to five from the Ionia County Intermediate School District. 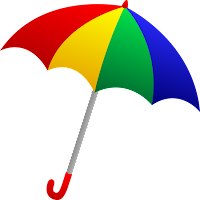 Jean Warren's Preschool Express also has some suggestions for home and school activities relating to the themes of rain, clouds, and umbrellas. 8. Recite The Itsy Bitsy Spider and read one of the many Itsy Bitsy Spider books. I like this one by Iza Trapani. Good for spatial concepts, wh-questions, predicting, and verbs. Download props and more for this nursery rhyme from Kizclub.com and/or use your own props. My students loved putting plastic spiders up a real downspout purchased at my local hardware store. 9. Find a lesson plan for Cloudy with a Chance of Meatballs, by Judy Barrett, at Bright Hub Education. Use this to make predictions and answer WH questions. This book is also good for eliciting and maintaining conversation. AND, for younger students look at this wonderful sensory bin (also good for vocabulary) at I Can Teach My Child. 10. Observe clouds daily to express descriptive words such as fluffy, round, long, skinny, huge, little, white, and gray. Download the Free Rain Preschool Printables, at Two Teaching Mommies, for the opportunity to use more describing words while completing the Cotton Ball Clouds activity. 11. Design an umbrella with the Umbrella Designer app to practice descriptive words. 12. 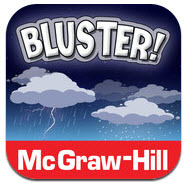 For readers, play Bluster and one of the Rainy Day Boot Match-Up games at Communication Station: Speech Therapy PLLC.